In 1926 Lieutenant Commander Byrd turned his sights to flying to the North Pole. He gained the support of the National Geographic Society but needed additional funds to finance the attempt. Byrd went to wealthy benefactors like John D. Rockefeller who chipped in. Then he approached Edsel Ford, but how could he ask Ford for money? Byrd had secured the use of a tri-motor plane manufactured by Anthony Fokker, not a competing aircraft manufactured by Ford. 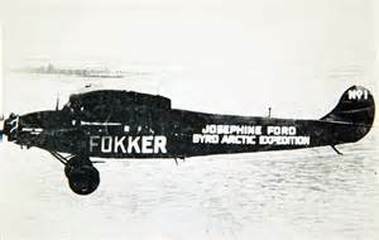 He solved this with a brilliant marketing plan: He said he would name the Fokker the “Josephine Ford” after Edsel’s daughter. He got the donation. North Pole in the dirigible Norge from the same location. It was going to be a race! Since unloading the Josephine Ford at the dock was out of the question Byrd’s solution was to lash the Chantier’s four lifeboats together. The crew then lowered the Fokker onto the makeshift raft and rowed to shore and hauled the heavy plane up a slope on skiis. Then the men got to work tamping down a “runway” on the snow surface. Byrd and his pilot Floyd Bennett made three unsuccessful take offs, nobody had ever flown a Fokker tri-motor with skiis before, so they were learning as they went. 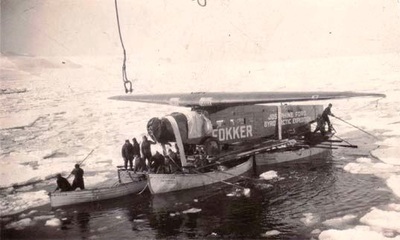 Finally at 1:58 AM on May 9, 1926, Byrd and Bennett successfully lifted off in the Josephine Ford headed for the North Pole. Byrd used a “sun compass” to navigate since traditional magnetic compasses were useless in the Arctic. They flew between 2,000 to 3,000 feet over the monotonous expanse of ice interspersed with open leads of water. Eight hours into the flight Byrd and Bennett were startled to see an oil leak in the starboard motor. This could be big trouble, if the engine quit it was doubtful the heavily laden Fokker could remain aloft on just two engines. Bennett suggested they land to attempt a fix but the ice below was cracked and broken so a landing and takeoff were risky. Or they could turn around and try and make it back to Spitzbergen. But they were only an hour from the Pole so Byrd gambled and gave the order to fly on. At 9:02 into the flight Byrd calculated they were at the North Pole! He made several sextant observations to confirm the fact and instructed Bennett to fly the Fokker in a four mile circle around the imaginary point just to be sure. Then they turned south towards Spitzbergen. The flight home was aided by two positive events……the oil leak in the starboard engine stopped, and the Fokker was much lighter because it had burned lots of fuel which increased their air speed. On his return to the United States Byrd was treated as a national hero, a tickertape parade was held for him in New York, and Congress promoted him to Commander and awarded him the Congressional Medal of Honor. He and Bennett flew the Josephine Ford on a national tour around the country celebrating the triumph of aviation in exploration and discovery. 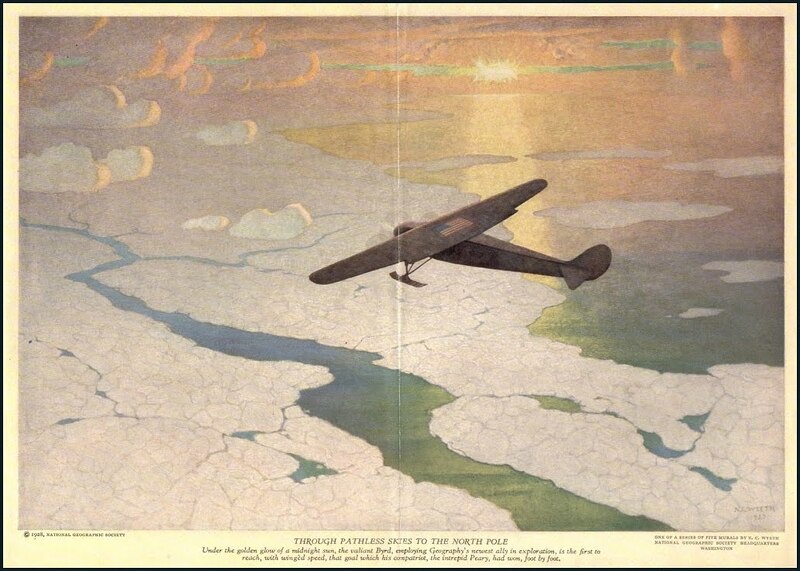 Race to the Top of the World: Richard Byrd and the First Flight to the North Pole by Sheldon Bart from Virginia Historical Society on Vimeo.